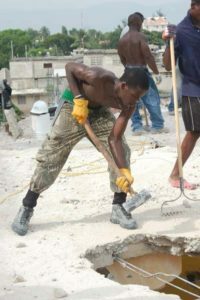 On January 12, 2010, the world changed for the country of Haiti and our family at St. Joseph’s Family Homes. Bill Nathan, Walnes Cangas, and Michael Geilenfeld, the Founder and Executive Director of St. Joseph’s, have shared their stories with us about that day. But we haven’t heard how the earthquake affected the lives of the younger boys at St. Joe’s. 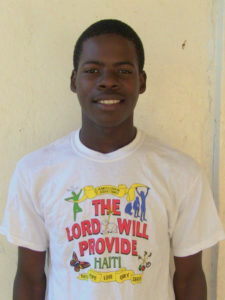 In the Christmas bulletin, Emmanuel shared with us how he came to live at St. Joseph’s. Now he would like to share with you how the earthquake that took 230,000 lives changed his life. “When the earthquake happened on January 12th, I thought I was going to die. I wouldn’t live to see my 16th birthday on Dec. 25, 2010. But I heard God calling my name and I believe I survived the earthquake so I can become a leader in the St. Joseph Family. I see Bill, Walnes, Jacky, Melchi and Maya serving God by having leadership roles. That is what I dream for my future. I am very happy that I have been able to help with the demolition of St. Joseph’s from 6:00 a.m. until 4:00 p.m. this past summer. I was working to help with the hauling of rubble. That is the first step to be able to rebuild St. Joseph’s. It is exciting and hopeful for me to be a part of this new beginning.